Throughout A Plain Account of Christian Perfection, John Wesley continually refers to our walking as Jesus also walked, which we specifically discussed in Chapter 5. However, because of the importance of our understanding this important concept of Christian perfection, we are discussing it again here in this Chapter. 6. the one who says he abides in Him ought himself to walk in the same manner as He walked. The apostle John's words are extremely strong. The person who calls himself or herself a Christian is also one who is saying, "I have come to know Him," and am following Him. If such a person is not "living" the commandments that Jesus commanded us to follow, which are fulfilled through unconditional love (Matthew 22:37-40), then the apostle John says that such a person is a liar and that the truth of Jesus Christ is not in them. The key to our understanding of how we walk with God (Jesus) is love. To have the love of God perfected in us is a state of being; it is not something we achieve by doing. Love produces the good works, not the other way around. The way we physically live, speak and act is a reflection of our spiritual being. However, as the apostle Paul discusses extensively, and as we have already discussed, our physical being is constantly subjected to the lusts and desires of this corrupted world. While both of these opposites, the perfection of God's love and the corruption of the world, are as real as light and darkness, or hot and cold, or good and evil, they are all controlled by the "positive" and not the "negative". In other words, light cancels out darkness and the truth cancels out the lie. Most people consider the opposite of love to be hate, but it is really fear; and as the apostle John also tells us "perfect love casts out fear" (1 John 4:18). Thus, the more we love, or the more that God's love is perfected in us, the less fear we should experience. Similarly, the more light we have, the less darkness; the more heat, the less cold; and the more good, the less evil. Going along with the world, giving into ungodly peer pressure, or just acting upon our lusts or pride are expressions of our fear of not being accepted or of missing out on something we want. But God's perfect love can change our desires, if we truly want them to be changed. Thus, we could say that our Christian perfection is the spiritual state of being in which God's love is truly perfected in us. And once God's love is perfected in us, then it becomes increasingly more evident in our physical life (speech and actions). This is when we learn to walk as He walked. "(1) Perhaps the general prejudice against Christian perfection may chiefly arise from a misapprehension of the nature of it. We willingly allow, and continually declare, there is no such perfection in this life as implies either a dispensation from doing good, and attending all the ordinances of God, or a freedom from ignorance, mistake, temptation, and a thousand infirmities necessarily connected with flesh and blood. We have found that there seems to be in many sectors of Christianity a deception that seeks "a dispensation from doing good". This is done through an attempt to use scripture to justify evil and perverted acts, rather than following those attributes evident in perfected Godly love. As an example, they attempt to justify war by citing Cornelius, a Roman soldier, who became a Christian. They justify hunting by emulating Nimrod and Esau, two men who were evil. 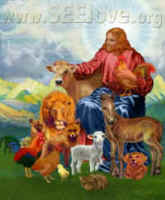 They justify the horrors of factory farming because Jesus supposedly ate a piece of fish. They justify destruction of the environment and the torture of animals because God gave us "dominion", rather than following its true meaning of "stewardship". These are just a few of the many examples by which people try to justify their evil intent and deny any portion of Christian perfection. It's as if there is a deliberate attempt to distort Ephesians 2:8-10 to say "we are saved by grace for evil works, which God prepared before hand." "(2) First. We not only allow, but earnestly contend, that there is no perfection in this life, which implies any dispensation from attending all the ordinances of God, or from doing good unto all men while we have time, though 'especially unto the household of faith.' [Galatians 6:10] We believe that not only the babes in Christ, who have newly found redemption in His blood, but those also who are 'grown up into perfect men,' are indispensably obliged, as often as they have opportunity, 'to eat bread and drink wine in remembrance of Him,' [Luke 22:19-20; 1 Corinthians 11:24-26] and to 'search the Scriptures'; by fasting, as well as temperance, to 'keep their bodies under, and bring them into subjection,' and, above all, to pour out their souls in prayer, both secretly and in the great congregation. 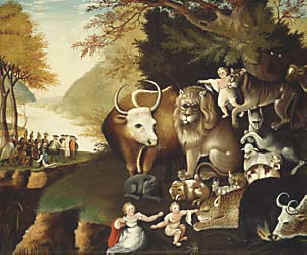 "(3) We, secondly, believe that there is no such perfection in this life as implies an entire deliverance, either from ignorance or mistake, in things not essential to salvation, or from manifold temptations, or from numberless infirmities, wherewith the corruptible body more or less presses down the soul. We cannot find any ground in Scripture to suppose that any inhabitant of a house of clay is wholly exempt either from bodily infirmities, or from ignorance of many things; or to imagine any is incapable of mistake, or falling into divers temptations. "(6) This it is to be a perfect man, to be 'sanctified throughout,' even 'to have a heart so all-flaming with the love of God' (to use Archbishop Usher's words) 'as continually to offer up every thought, word, and work, as a spiritual sacrifice, acceptable to God through Christ.' In every thought of our hearts, in every word of our tongues, in every work of our hands, to 'show forth his praise who hath called us out of darkness into his marvelous light.' [1 Peter 2:9] O that both we, and all who seek the Lord Jesus in sincerity, may thus 'be made perfect in one!' "
This is the doctrine which we preached from the beginning, and which we preach at this day. Indeed, by viewing it in every point of light, and comparing it again and again with the word of God on the one hand, and the experience of the children of God, on the other, we saw further into the nature and properties of Christian perfection. But still there is no contrariety at all between our first and our last sentiments. Our first conception of it was, It is to have "the mind which was in Christ," [1 Corinthians 2:16] and to "walk as he walked"; to have all the mind that was in him, and always to walk as he walked; in other words, to be inwardly and outwardly devoted to God; all devoted in heart and life. And we have the same conception of it now, without either addition or diminution. For anyone to challenge the ideals of Christian perfection is to also challenge the truth of Scripture. If Jesus knew it was impossible for us to be perfect as our heavenly Father is perfect, then why did He tell us to be perfect? (Matthew 6:10) If we were not to have the mind of Christ (1 Corinthians 2:16), then why did the apostle Paul tell us that all born again believers are given the mind of Christ? If we were not to have the love of God perfected in us in a manner that would allow us to walk as Jesus walked (1 John 2:6), then why did the apostle John tell us to walk as He walked? We are told these things because they are true, and because they are possible, and because we can and should walk as He walked.